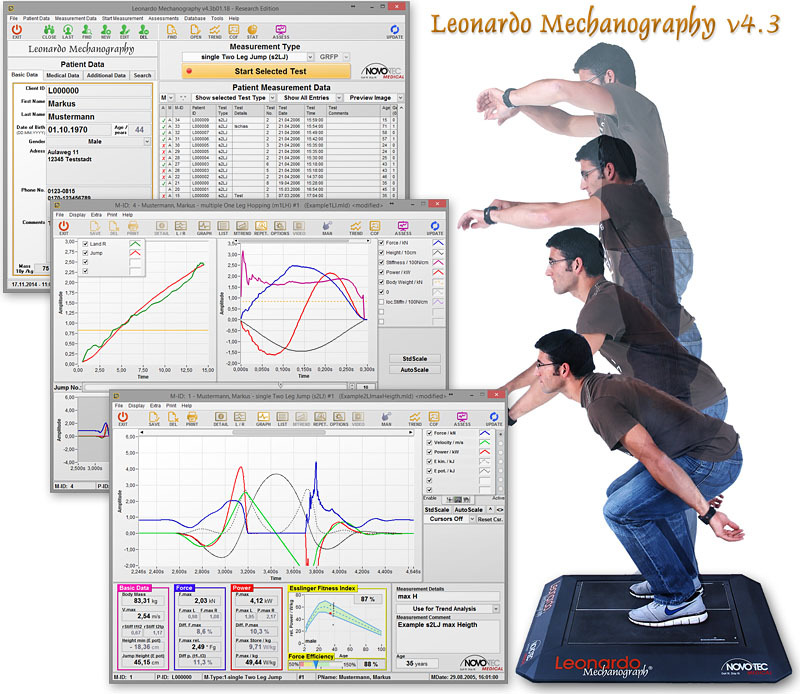 Leonardo mechanography enables objective automatic motion analysis, performance analysis and fitness test. It allows early diagnosis of movement disorders, objective and reproducible assessment of muscular performance and flexibility as well as the documentation of changes. The main objective of Leonardo Mechanography is to provide efficient quantification of functional human motion based on physical parameters. Leonardo Mechanography analyses functional everyday movement patterns because results are highly reproducible across a large age group from children to the elderly. Leonardo Mechanography offers essential advantages for clinical use, allowing the simple quantification of peak force, peak power and left-right differences of movement patterns. It requires no additional complex measurement devices, no time consuming subject preparation and is easy to use and results are produced within minutes. This concept offers essential advantages for clinical use: for one it allows the objective quantification of actual maximum forces, maximum power and left-right differences during physiological movements. But the method also very easy and very fast to apply in clinical use since no preparation of the subject or complex additional instruments are needed. Leonardo Mechanography has been used in numerous international research projects. It has been used to characterize different patient cohorts as well as to document and to quantify effects of different interventions. It is for example one of the standard measurement techniques used for bed-rest studies of the European Space Agency (ESA). Human movement can be quantified objectively based on the physical parameters. Essential for quantification of the power output of the human body are: force, velocity and time. Leonardo Mechanography measures dynamic ground reaction forces and calculates the centre of mass related physical parameters including acceleration, velocity, energy, power, jumping height and stiffness or flexibility. The variation of the ground reaction force (GRF) over time and space are measured. When two separated platforms for the left and the right leg are used side-differences (asymmetries) during symmetric physiological movements like jumping or chair-rising can be analysed. The acquired spatial resolution of the measured forces allows stabilometric analysis, for example, during various types of balance tests. Combination of Leonardo Mechanography and Stratec pQCT Computertomographs for detailed diagnostics of the functional muscle-bone unit.